“‘Save our Sounds‘“ is the British Library’s programme to preserve the nation’s sound heritage.” With this statement, the British Library is addressing one of the most pressing conservatory issues of our times – how to save the recordings made in the last 100+ years. A survey has been started, beginning on January 12 and running until the end of March, 2015, to find out how much material will need to be processed. One of the treasures already saved is an early recording of J.R.R. Tolkien’s voice – a treasure, indeed. 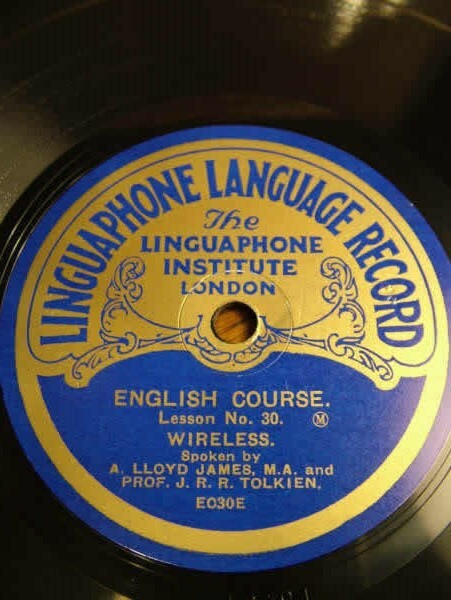 The earliest recording of Tolkien’s voice, as far as is known to us, was made by June 1930 for the Linguaphone Conversational Course in English, issued by the Linguaphone Institute of London as a set of 78 rpm records. Tolkien read the introduction to, and played one of two roles in, Lesson 20, ‘At the Tobacconist’s’, and again was one of two readers for Lesson 30, ‘Wireless’. As Tolkien did not earn a fortune as a professor with the University of Oxford he would have been delighted at getting this opportunity to make some extra money. Luckily enough for us today, shellac has proven itself to be a fairly reliable carrier of information and Tolkien’s readings were among the first to be saved in the British Library’s ongoing efforts to preserve its holdings for the future. As Hannah Furness with the Telegraph noted, “the public is now able to hear the voices of of Christabel Pankhurst, Florence Nightingale, James Joyce and Noel Coward, as well as decades-worth of theatre productions such as the opening night of the Old Vic’s Hamlet directed by Sir Laurence Olivier.” And yes, J.R.R. Tolkien’s voice, too. Save our sounds. The British Library’s project. Early spoken word recordings. At the Tobacconist’s. With the British Library. Tolkien Collector 5. 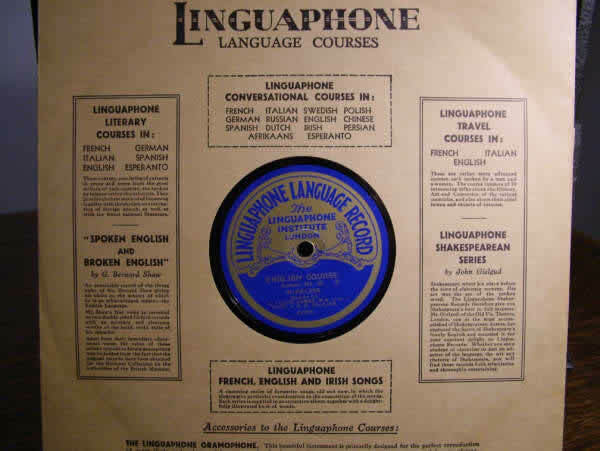 Further information on the Linguaphone recordings: “Tolkien and Linguaphone” by René van Rossenberg. Recordings. The J.R.R. Tolkien Companion and Guide. Reader’s Guide. By Christina Scull and Wayne Hammond. pp. 822-824. @Soundarchive. Follow the British Library’s Twitter account for more information. W.F. Bolton, D. Crystal (eds.) The English Language. Volume 2: Essays by Linguistics and Men of Letters 1858-1964, CUP, 1969. Picture credits: Linguaphone record – by kind permission of the Tolkien Library. Thank you to David Doughan for reminding me this is a shellac record, not a vinyl one.